A note about Light It Technologies / Montana Light. After over a decade in business, Montana Light has closed its doors. 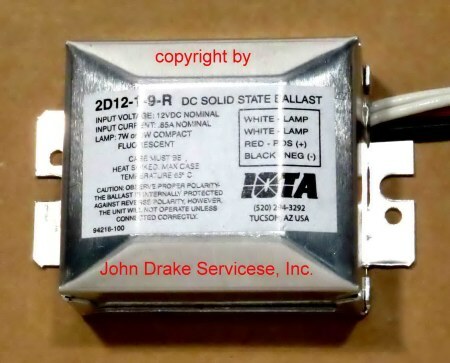 and ballasts and their quality was second to none. The off-grid and specialty lighting market will miss them. 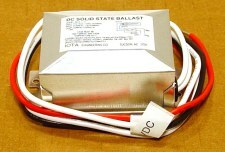 ballasts, just in a larger platform. 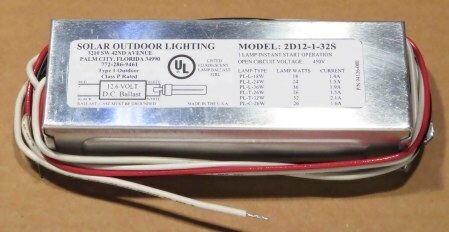 12, 24 or 48 volts d.c.
You can also use these to make your own lighting fixtures. 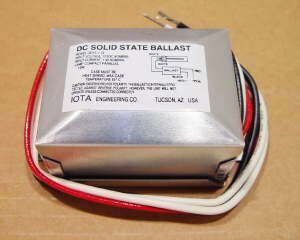 and specify these inverter/ballasts in their products. Very popular for use in insect attracting lights anf for UV sterilization units. The wires are tinned to protect against corrosion for long term use. These are designed to operate a single tube - please check the description before ordering. with Radio Frequency Interference suppression. wiring and carry a ONE YEAR factory warranty. A note when using fluorescent lights. is to run them on too low of a voltage. from the battery to the light is of the right gauge. You can always call us for more information. 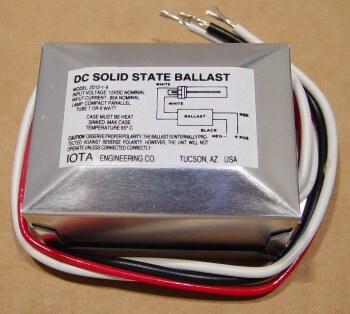 The technical name is an inverter-ballast. the production of their inverter/ballasts. hand and what IOTA still has in stock. 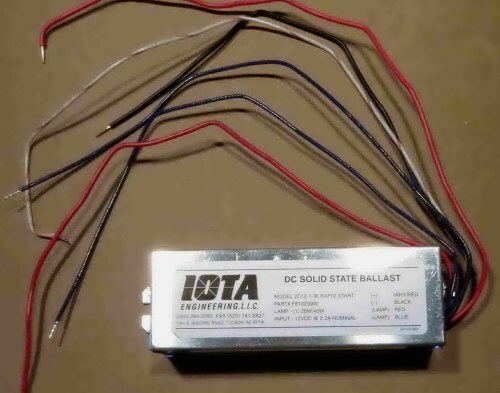 IOTA inverter ballasts have both a model number as well as a part number. A note when using with insect lures. are installed in machining centers as well as in boating applications. need to fire and run the fluorescent tube. These are often used with U.V. sterilization tubes in portable germicidal lamps. Also used in battery power insect lure attraction / collection equipment. 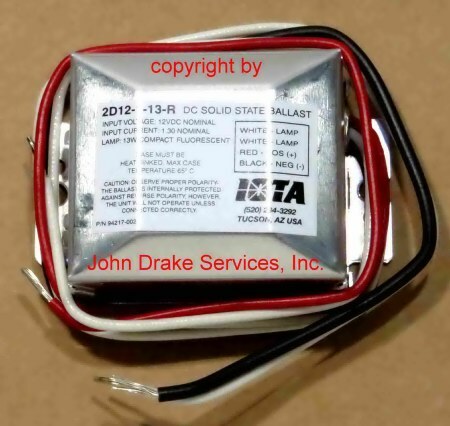 Input voltage range: 10.5 to 14.5 volts d.c. for the 12 volt model. IOTA has no more of this model. The picture and information are being left here for reference only. This model has a smaller (Reduced or "Robertson" can) housing than the standard model. This model has a smaller (Reduced can) housing than the standard model. These are widely used in marine applications. use in making an insect lure. the last IOTA had and they sold out. 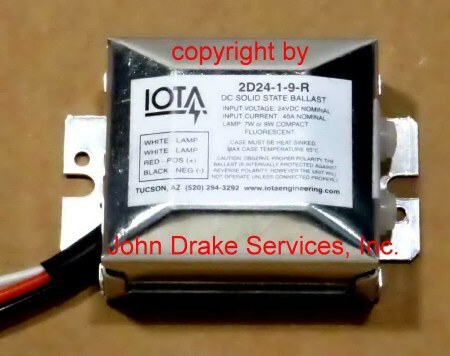 IOTA has discontinued this model. We do not stock this model. These are often used in the restoration of Good Humor ice cream trucks. This model has a shallow housing and is UL listed. by Solar Outdoor Lighting in Palm City, FL. To operate a single 28 to 36 watt tube. Input Range 24.0 to 28.0 volts d.c.
To operate a single 36 to 40 watt tube. inverter based alternative energy systems. These are used extensively in the telecommunications industry. These come pre-wired and ready to install. The maximum operating temperature is 150 degrees F.
mounted to a heat sink such as aluminum sheet. Luminator made for Mark IV Industries Company. tubes from 72 volt d.c.
PL-9 tubes is 0.27 amps. The lamp current is 180 milliamps (0.180 amp). tubes from 24 volt d.c.
Line current when using two PL-7 tubes is 0.22 amps. We purchased, and sold, the last ones they had on hand. or collection trap with a 12 volt battery. the night, the ballast will shut down around 10.5 volts. 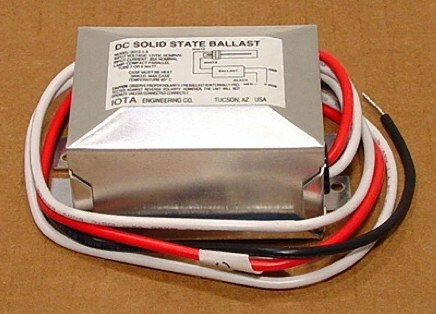 the ballast and reduce the life span. in-line fuse on the positive input wire going to the ballast. 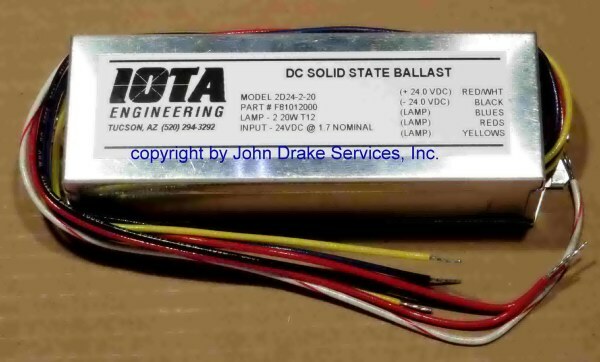 ballast can over-amp itself while trying to keep the tube running. of charge / dis-charge cycles available. 3) We accept telephone and fax orders and accept Mastercard, AMEX and Visa.